When the root chakra is balanced, you will find contentment, happiness, and inner peace. You will have more compassion and patience towards yourself and those around you. A balanced root chakra brings emotional stability and an incredible sense of being able to cope with whatever the universe throws your way. We all have met people like this, individuals who simply ooze serenity. They smile and the world around them smiles back. Their calmness is contagious and fabulously good for the soul. When the energy of the root chakra is flowing well, you feel grounded, yet free as a bird. On the other extreme, you may have met people who are suffering from an out-of-balance root chakra. People who bounce from project to project, thought to thought, without proper attention to self-care. This behavior can lead to burnout. Alternatively, people whose root chakra is not balanced can be lethargic, feel defeated, and be unable to get things done. What is my Muladhara Chakra? The word Muladhara is a combination of two Sanskrit words. : "Mula," which means “root” and "Adhara," which means “support” or “base." In order to grow to your full potential, you need a solid foundation. The seven chakras are all important and interconnected. However, the root chakra is especially important, as it is the base of our whole chakra system. It is the most instinctual of all chakras, the very basis of our survival center. Our “fight-or-flight” response is initiated here. The root chakra is associated with grounding, vitality, and stability. It includes our survival instinct, our desire for safety and security, and our basic needs, such as food and shelter. Also associated with the root chakra are emotional needs and functions, like family loyalty, and beliefs and values. When the aforementioned needs are met, the root chakra is balanced, resulting in a stable, grounded, and secure individual. Where exactly is my Muladhara chakra? Our root chakra is located at the base of the spine, the pelvic floor, and the first three vertebrae. It is associated with the earth element and directly linked to our ability to dig in and feel firmly rooted in our lives. Working with your chakras is all about balance. Releasing excess chakra energy is just as important as stimulating chakras to gain energy . The poses below are aimed at both stimulating and releasing energy from the Muladhara in order to allow for true transformation and personal growth. 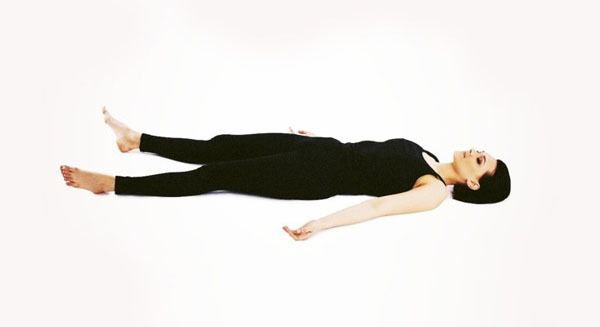 Spend five slow breaths in each pose. Close your eyes and feel the earth beneath you. Inhale taking in fresh nourishing energy, exhale releasing all of the things that no longer serve you or help you move forward. Let your whole body relax. Notice how it feels to be completely supported by the ground beneath you, and welcome this balance of surrender and support to carry you through your practice. This pose brings you close to the earth, and helps calm the mind and spirit while strengthening the lower back and ankles as well as opening the hips. Our feet are our roots, and through the feet we feel the energy of the earth. To awaken the fascia of the soles of your feet, gently tuck your toes under as you rest on your knees (a block or bolster can be used to sit on if needed). Hold for one minute before releasing. Repeat three times. A fabulous pose to ease a busy mind, Uttanasana helps us find center and calmness. At the same time, it slowly stretches the hamstrings and relieves tension in the entire back. Like a tree, we can feel the earth beneath us supporting and providing the nutrition we need. Both balancing and relaxing, mountain pose allows us to feel centered and focused in the present moment. Try doing this on grass for added connection to the earth. Three to five sun salutations will help you tap into that sense of inner strength and connection with the earth. You will feel a slow, steady heat building from within, and a sense of power and focus as we connect with each inhale and exhale. You will eventually notice how the mind surrenders to the current moment as you work your way deeper into your moving meditation. Close your eyes if you feel comfortable doing so. This pose creates an intense stretch for the psoas and quad muscles. These muscles are associated with our flight-or-fight mechanism and are deeply connected to the first chakra energy center. 5 breaths here allowing muscles time to transform any residual fight or flight energy into courageous yet calm inner strength. Virabhadrasana means "fierce warrior," so what better pose to help you face your fears and doubts? This pose uses the body’s natural flow of energy to stimulate it while both feet are firmly on the ground, helping you dig deeper into your inner reserves of strength and determination. This pose allows your feet to be firmly rooted to the earth. At the same time, the spine releases excess root chakra energy as well as stimulates the throat chakra, opening the heart and solar plexus chakras and balancing the sacral chakra. This asana opens the muscles of the groin and lower back, giving the root chakra an opportunity to release its vitality into your body. Let yourself be fully supported by the earth beneath you, and let go of all tension in your body. Remind yourself “I am safe, I am supported” with each inhale and exhale. When we find ourselves calm and manifesting happiness from within, approaching life from a calmer more grounded perspective, that is when the magic starts to happen! Happiness is, after all, an inside job, and once we are grounded and strong within ourselves then we start to attract like-minded people into our world!